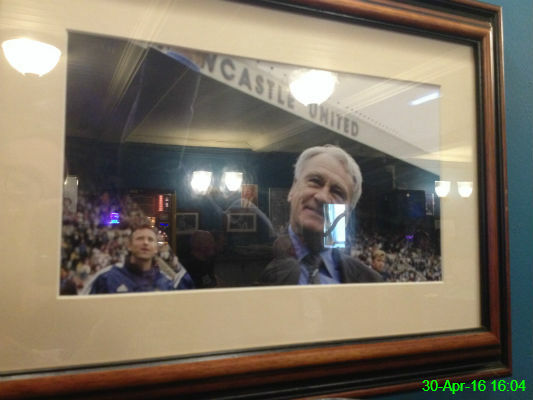 I hoped this picture of Sir Bobby Robson would bring Newcastle luck in their game against Crystal Palace. It may well have worked since we won 1-0. 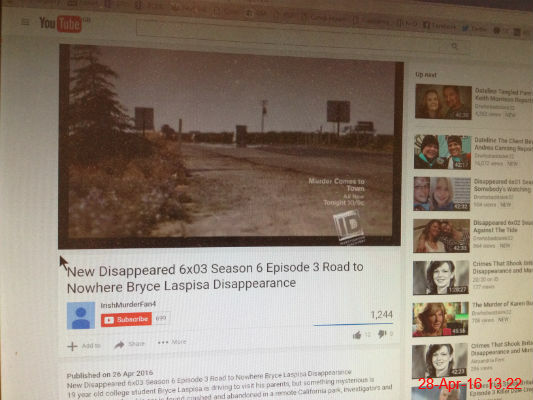 I spent my lunch break watching a new episode of Disappeared about Bryce Laspisa, who went missing from Castaic, California in August 2013. It's an interesting case that I've followed from the beginning, so hopefully this will bring about some new leads. The (blurred) result of my workout today. 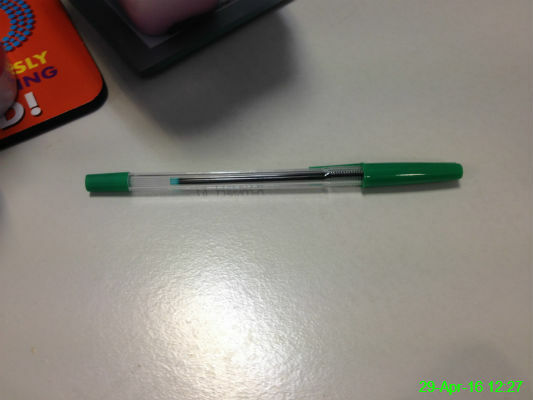 I'm too much of a creature of habit so I resisted the urge to go for another minute and finish on my lucky number 32. 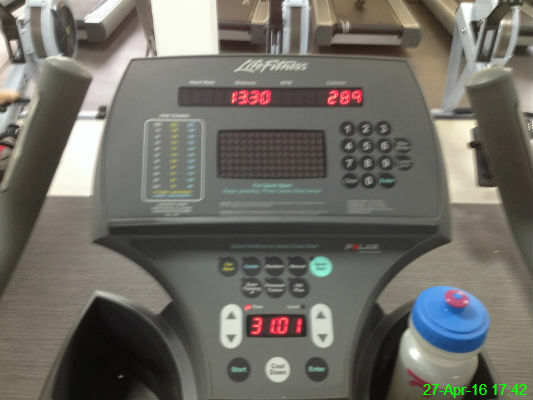 The other numbers tell me it was 13.30km and 289 calories burned, though the latter is obviously total guesswork by the machine! 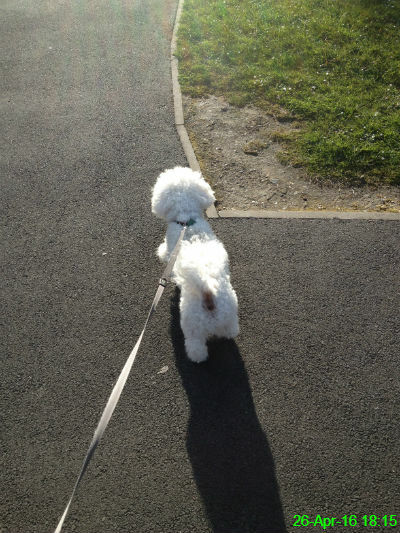 I took Bilbo for a walk and as usual he was keen to get away from me. 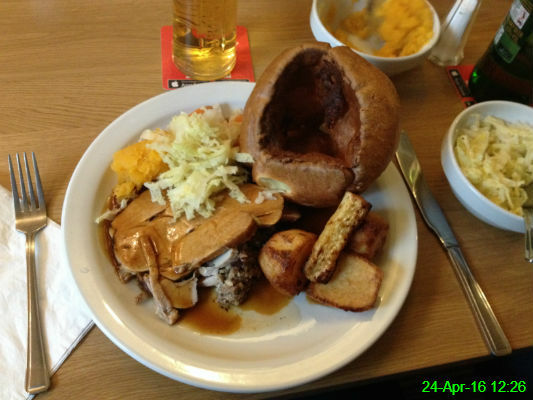 I had a roast pork dinner at the Black Bull in Wylam, which was beautiful as always. Those Yorkshire puddings are incredible! 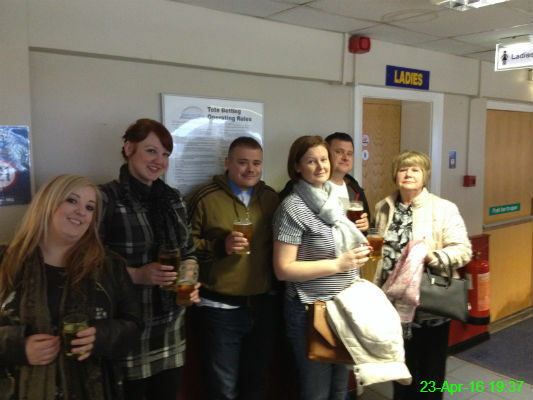 We spent the evening at Brough Park greyhound track. Stu had wandered off somewhere when I asked everyone to assemble for a photo, but he was there as well as Vicky, Ali, Michael, Catherine, Chris and Kathy. 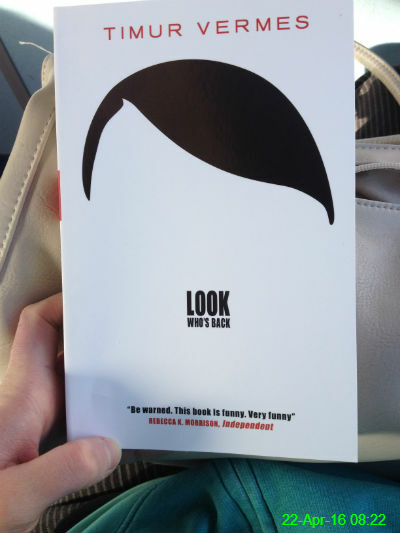 My latest read is an amusing tale about Adolf Hitler waking up in modern-day Berlin. 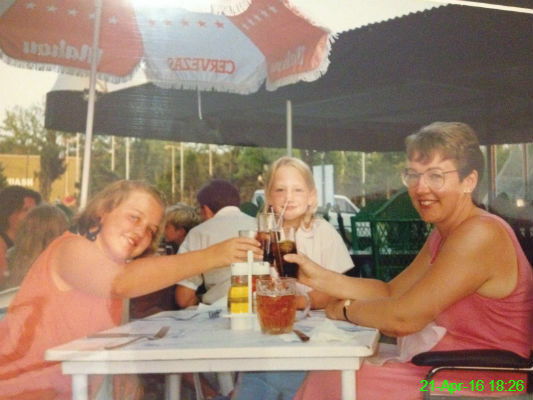 I raided Mam's photo albums and found this gem of me with her and Ali in Majorca, 1992. 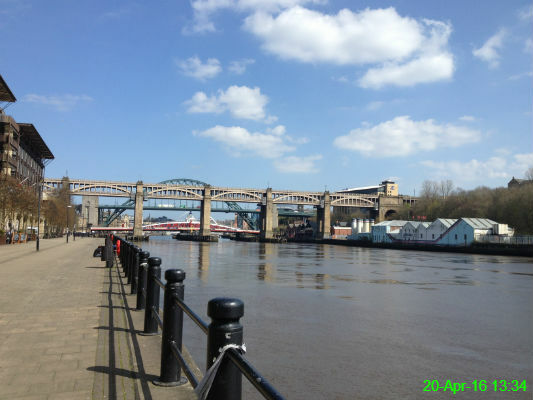 It was a beautiful spring day so I walked along the quayside on my lunch break for the first time in ages. There were lots of people sitting outside the bars eating and drinking so I tried to keep my jealous rage to a minimum, and instead appreciated the exercise. 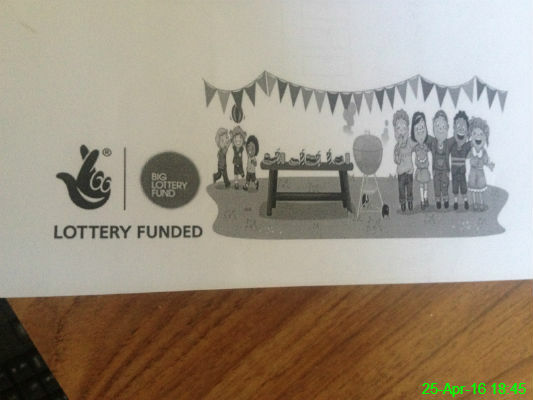 My payday treat? New socks. It's not a month to remember. 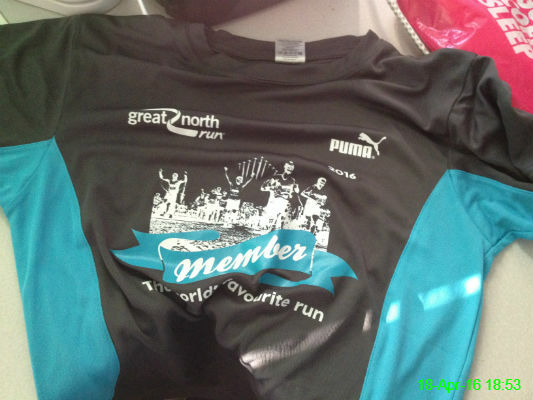 My Great North Run member's t-shirt arrived! I'm pleased it's a more suitable material than the cotton finisher's t-shirts. 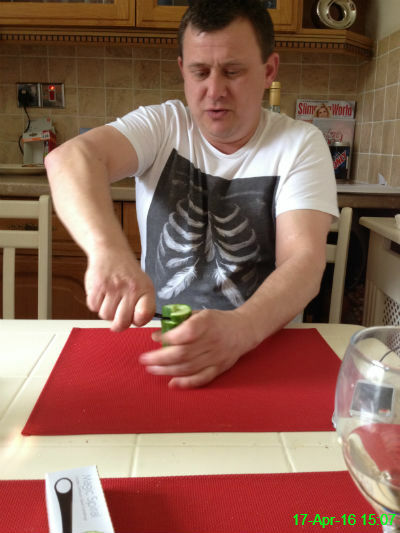 Christopher attempted to demonstrate how to make a spiral of cucumber, without much success. 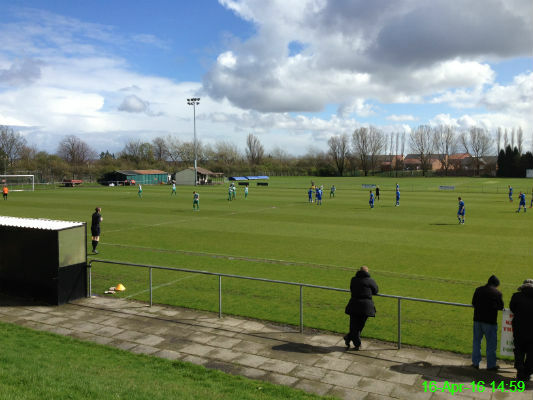 It was a frustrating defeat for Allotment when they conceded a late goal. 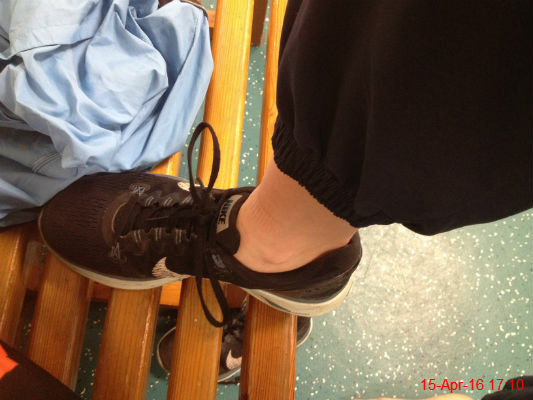 My socks got soaked on the way from work to the gym so I was forced to remove them for my workout. There are few things I find as disgusting as the feeling of my feet in trainers without socks. 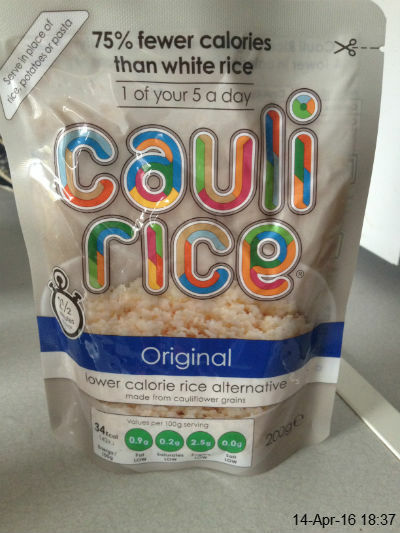 I've been meaning to try cauliflower rice for ages, and this was an excellent lazy option. I had it with a slightly unusual curry - balti made with broccoli, peas and pigs in blankets - but it proved a success! 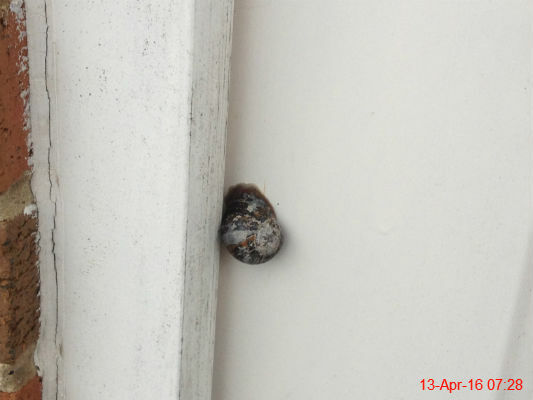 A visting snail has attached itself to our door. 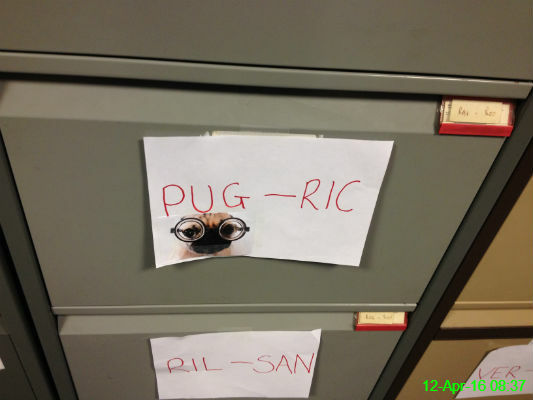 Fay is a big fan of pugs so I thought she may have labelled the cabinet like this on purpose, but apparently not! I did encourage her to include the picture to brighten up our days. 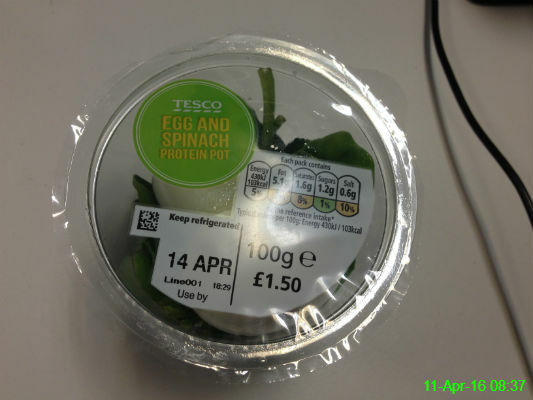 I fancied a healthier breakfast than yesterday so I grabbed this pot from Tesco. It was nice, but  is a bit steep for two hard boiled eggs and a few leaves! 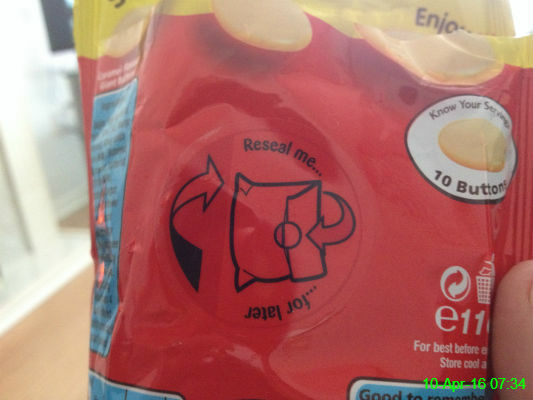 I woke up with a sweet tooth and did not need to make the use of this sticker for resealing the bag of caramac buttons! Ali and I went for a 12 mile walk this morning. 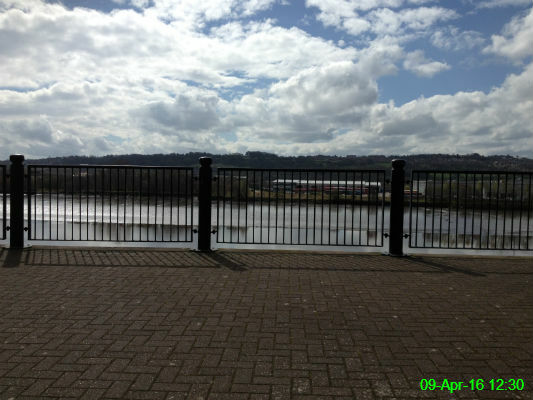 This is the point when we arrived at the quayside and paused for lunch. I went to Mario with the girls from work. 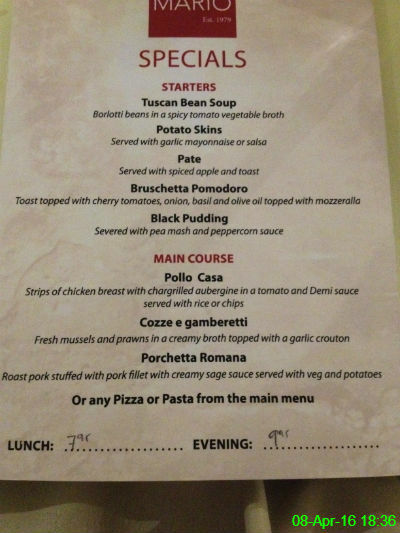 My choices were black pudding and an extra spicy pollo pizza, washed down with Peroni. No complaints from me! I met up with Lisa and Kevin for a few hours and of course they had to pose for a photo before Kevin left to go to a family meal. 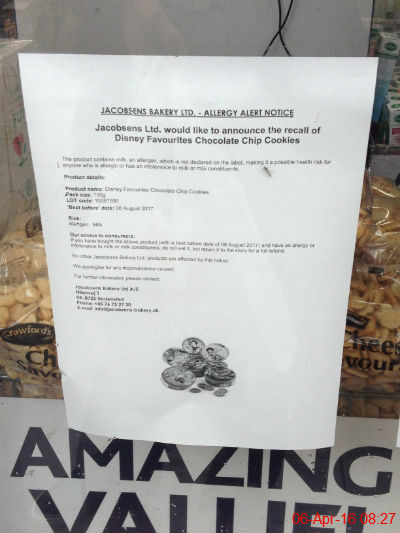 I had to wait a few minutes for the pound shop to open so I passed the time by reading this notice posted on the window. It just made me want cookies. 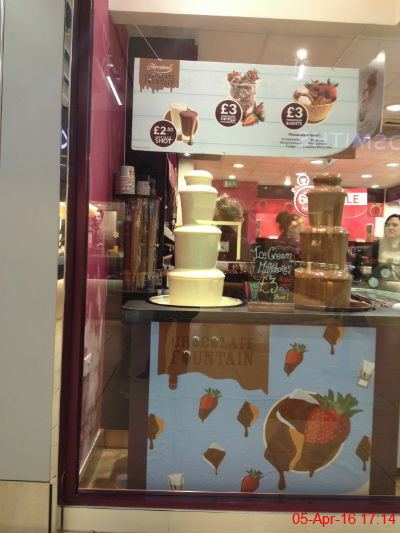 Since I skipped the gym tonight, I refrained! After my recent purchase, I'm now throwing these in the bin. 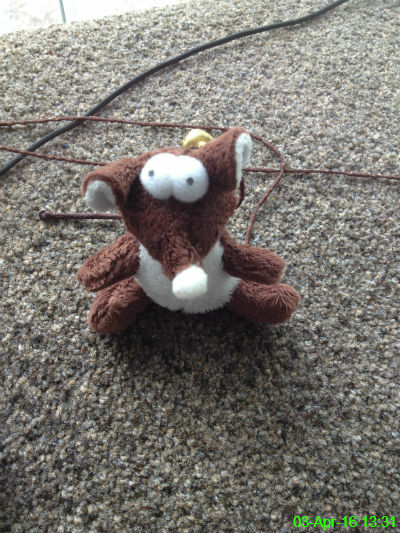 I likened this toy of Carson's to a really sinister Roland the Rat. I'm not sure why because it doesn't really look anything like Roland, he was just the first character that came to mind! 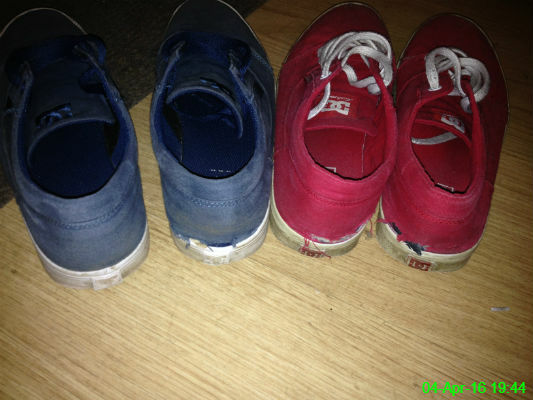 I've bought two new pairs of DC trainers because they're always really comfortable. That means I can bin the two pairs I currently have which have completely fallen apart. 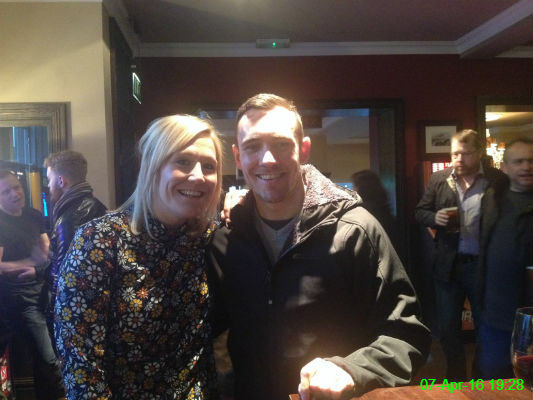 I went to Turknaz in Whitley Bay with Ali and Vicky. 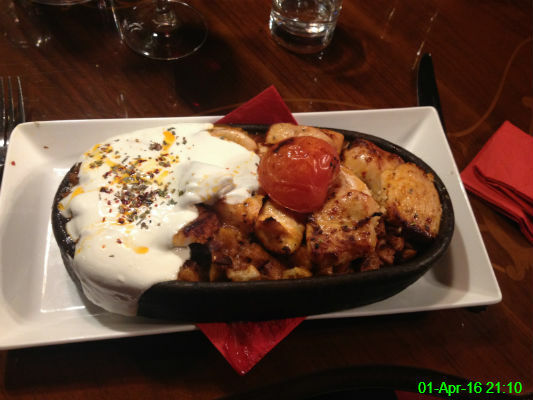 This was my main course - chicken iskender - which was absolutely beautiful and extremely filling!